Tag Archives for " intention "
Success is a relative term isn’t it, but if you ever come to recognize it you know what it feels like. For me, it feels less like some measure of profit and more like a measure of control – as in how much I feel in control of what’s going on around me. Businesses love to wrestle control away from us and even make us feel pretty darn helpless at times. 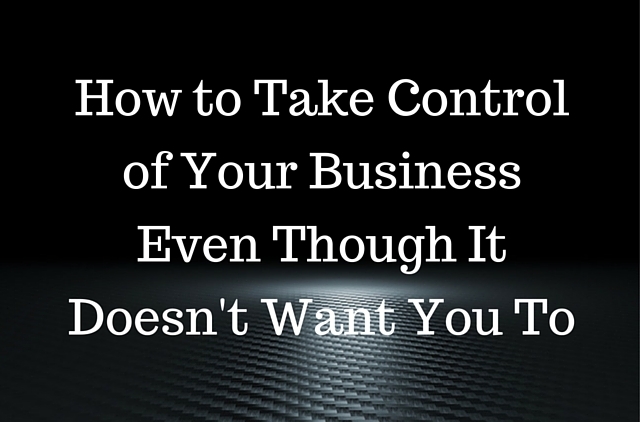 It’s as though the business doesn’t want you to ever feel like you’re in control. Of course, the concept of control itself is a strange beast. I mean the more you try to control every element of your business the more constricted your experience becomes. Ironically, I feel most in control when I let go of as much as possible. I know that sounds a bit counterintuitive, but like so many times in life, we get more when we stop pushing and start allowing. Now the challenge with this idea for many is it seems to imply that you simply need to let go and hope. That’s not what I am suggesting at all – what I’m suggesting is that you create clear objectives and take action that you believe will guide you towards achieving those objectives, while remaining open to the idea that you just might not know exactly how everything is going to play out. There are practices however that I believe can keep you the path to success and in greater control of every aspect of your business, but I’m warning you if you are master these practices, you’re going to have to be willing to change a few things. Below are five key elements for taking control of my business. I believe that a great marketing strategy is a great business strategy, and the best marketing strategy allows you to change the context of how your business is viewed in comparison to every other business in your industry. You have to figure out what matters most to your ideal clients and allow your business to be remarkable at addressing that – that’s marketing strategy. No amount of reading books and even blog posts will teach you how to do this practice fully – it comes from living with your ideal client for a while and observing what they really care about. And trust me it’s not about your software, it’s about how your software helps them get a raise, keep their key clients, or dominate their market. Every day you have to make choices with how you spend your time. There is never enough time to do everything you think you want to do. You have to work with intention! There are many, many seemingly important tasks ahead of you today and tomorrow and the next day, but when you know where your time is best used and create a daily intention to use it there first and foremost, you create the environment for real progress. If you are going to free up more and more of your time to focus on high payoff work, something’s got to give. The difference behind someone who has a job and something who is creating a business is that a job is simply a way to produce so many units of work for a given amount of money while a business is a way to orchestrate the units of work of many people to create an asset. Most people never really get past creating a job – even if that’s their name on the door. To create a business you have to create a delegation mindset. That starts with understanding how to delegate all of the lower payoff work you have on your to-do list and ultimately leads to you surrounding yourself with people smarter and more capable than you at turning their unique ability into the service of the business. Most marketers spend far too much time on generating leads and far too little time on understanding how to convert leads. Getting traffic is easy, heck given enough money any marketer can fill the lead pipeline, where the real money is made however is in understanding why those people who show up don’t buy, don’t come back and don’t tell their friends. You must get very good at researching, testing and analyzing your conversion results if you ever want to feel totally in control. Finally, entrepreneurs, by their very nature, can suffer from focus issues. The trick is to find ways to balance the high-end motor with the bargain basement breaks. For me, this practice has to be something of a daily ritual. You must commit to only a few priorities at a time and crush back the seemingly daily urge to run off after the new, new thing. There are many ways to attack the focus issue and most take habit changes. I’ve found that daily meditation is a practice that helps me in this regard no matter what I’m tasked with. Finding and engaging an implementer as described in the book Rocket Fuel (listen to my interview with one of the co author’s here), can be a great way to help you stay focused. Creating a weekly planning habit where you designate great chunks of time for high payoff work before all those meeting requests and oddball projects sap your schedule dry. Employing technology such as Focus.io to help keep you away from distractions like email with you knock out high payoff work. Even after many years of writing about these core practices I still find it challenging to balance letting go and gripping so tightly it can feel as though I’m choking the life out of my business, but I do know that this is indeed the key to small business success.